Joyce Tannian, Founder and executive director and Veronicah show the new 10,000 liter tank. Before the well, women in the community walked many hours every day to dig in a dry river bed to access barely potable water. Poor water often resulted in serious health issues for their families. In a community with hundreds of women, and each woman needing several cans of water to take care of her family, the water lines were long. The women were often forced to come at night in a group, with warriors to protect them from the elephants, hyenas, and lions that gather around the watering holes to drink. The 1,700 people in the community live in a remote area. No one had ever reached out to help them with their water struggles. That changed when Water is Life Kenya came on the scene. The two year Kuku well project involved digging a 570 foot (175 meter) well through hard volcanic rock to access reliable clean water. Water is Life Kenya raised over $60,000 for the deep well, a special pump and power source, and water storage facilities. The well will succeed because the organization trained local operators to maintain the pumps and monitor the facility. Oloirien Chairlady, Margrate Lesinko, proudly showed off her hay bales to Water is Life Kenya Program Assistant, Veronica Simaloi, in May. Veronica visited her when she was monitoring the condition of the Oloirien Group Cows. Margrate has been working together with her husband to conserve and store pastures, just as they had been instructed during Water is Life Kenya LAB trainings back in October. Margrate is providing an important example of drought preparedness for her group members and for her neighbors in Imbirikani. We are proud of her. She is leading by example. Members of the nine water management committees met as a group to discuss setting fair and appropriate prices and how they can collect enough revenue to maintain the wells and avoid service interruptions. 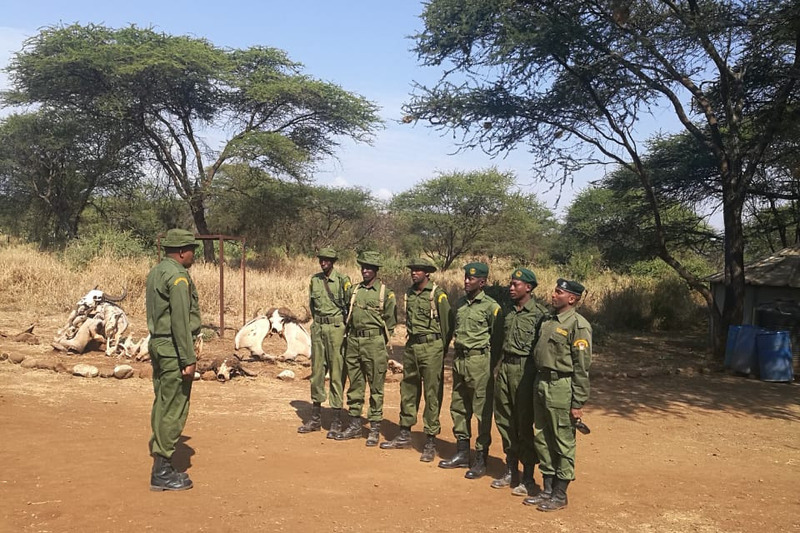 This spring we invested time and money to train the management committees of our nine deep well projects. We covered topics like setting water prices, budgeting, record keeping, and conflict resolution. We then moved out of the classroom into the field for a hands-on diesel generator operation maintenance and troubleshooting session. The Lenkiloriti borehole committee hosted us and proudly showed off their well-maintained, clean generator and generator house. The water committees participating in some onsite training at Lenkiloriti Water Borehole. When Water is Life Kenya hands over projects to the community after completing the drilling, equipping and construction works, we train our water management committees. As projects evolve, however, committee members move on, so there is need to train again. In addition, our new projects committees needed review of key lessons. and one of the first to benefit from a well we dug, spent 5 weeks with us this Spring. Larasha and Dorcas came to the US to give a TEDx (Ideas Worth Spreading) talk and to support us on our annual Water Walk and other events. Larasha’s talk, “How I learned confidence from a lion” is amazing. Dorcas’ story, “Education has no age” is inspiring. What they loved most about the US: green grass everywhere and imagining how happy and full their livestock would be in such a place. Surprising observations: The US is not just big cities, it has vast areas of countryside and people eat a lot of sweets. Larasha’s favorite things: pancakes, the rodeo, The White House, the “Singing Water” fountain show at Longwood Gardens, hamburgers, and chicken fajitas. Dorcas’ favorite things: bread, french fries, the “Singing Water” show, cute baby clothes, taps with hot and cold water, and the friendliness of people. Thanks to the time and unique skills of members of the Newark Delaware Professional Chapter of Engineers Without Borders (EWB), clean water for the children at Kenya’s Imurtot Primary School is now a reality. The EWB team takes a well deserved break. Andrew, Ranjit, Kim, Tad and John. This past Spring five EWB members made the second trip to Kenya. 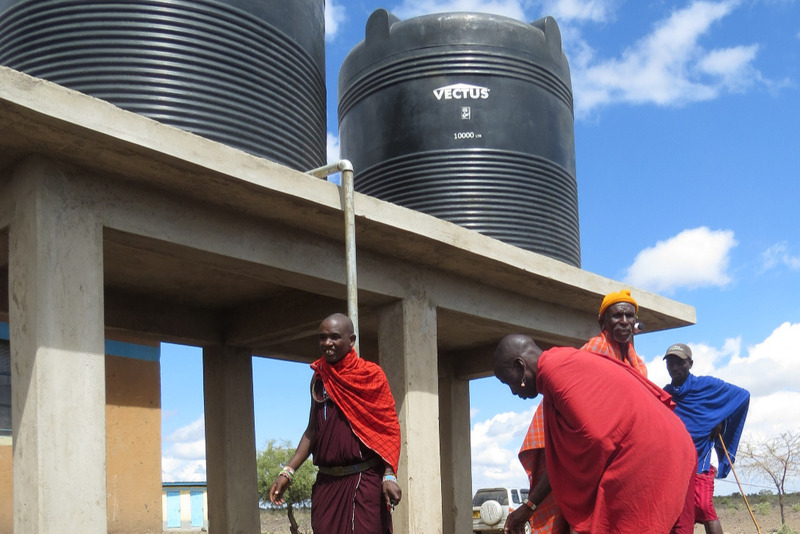 Working with Water is Life Kenya, the engineers installed a rainwater harvesting system on two school buildings, including gutters, downspouts, and six water storage tanks. Just after the team returned to the US, rains began at Imurtot and in only a few weeks, all six tanks (approx. 19,000 liters) were full and being used by the students. Water is Life Kenya’s 11 years of experience working in the area allowed trust between EWB and the community to be established easily. Challenges abound as they worked to get the gutters in place. In addition, work moved quickly because of our long term relationships with crafts people and suppliers. We are grateful for the strength of our partnership with EWB, which has brought forth the Imurtot Primary School rainwater harvesting system. Now Imurtot Primary School students can focus on their education without wondering where they’ll get clean drinking water.